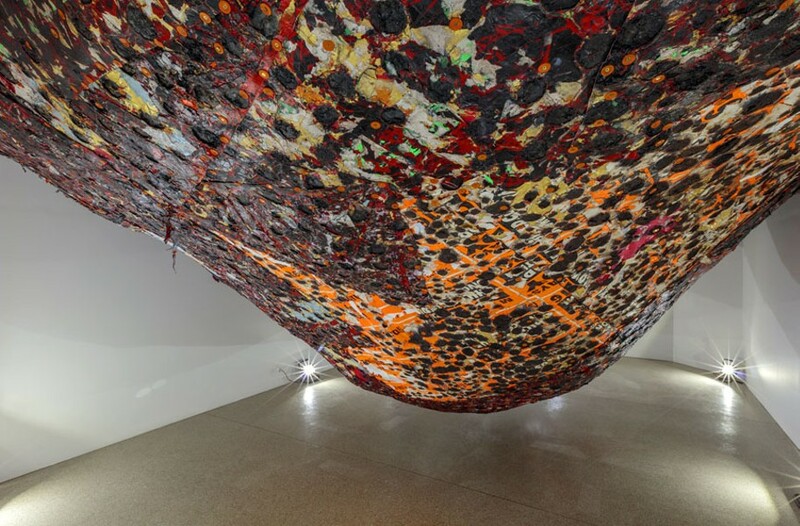 American Artist Mark Bradford Offers a Withering Take on the State of the U.S. With a Destroyed Twin to a Virginia Landmark | Arts and Culture | Style Weekly - Richmond, VA local news, arts, and events. Bradford’s voluminous and pockmarked “Spoiled Foot” at suggests the collapse of the social center. VENICE, Italy – It’s late August and I’ve come to this city only to find America at the world’s largest, most ambitious, thrilling and frustrating — in equal measure — contemporary art exposition. The Venice Biennale extravaganza is staged every two years in individual pavilions at the Giardini, a sprawling Venetian green space, and at dozens of other venues scattered along the quiet canals and shimmering waterfronts of this city on the Adriatic. 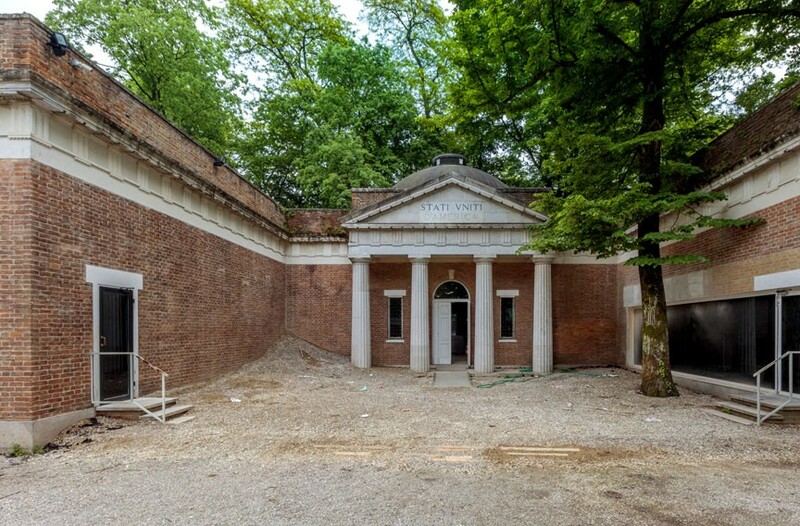 Hopping off a vaporetto, one of the city’s groaning and lumbering water buses, I enter the 57th Biennale’s bright red gates and make for the United States Pavilion: This is my patriotic ritual before exploring the scores of art offerings from across the world. The forecourt of the Monticello-inspired U.S. pavilion is covered in gravel and debris. The U.S. pavilion, a permanent fixture, was built some 75 years ago to resemble Monticello, a shout-out to Thomas Jefferson, the amateur architect who famously imported the neoclassical architecture of Andrea Palladio to the wilds of North America. Its red brick walls and Doric facade were designed by Fiske Kimball, long associated with the University of Virginia in the early 20th century, and the venerable Boston firm of Delano and Aldrich. The U.S. pavilion, like the modernist minimalism of the Swedish gallery, the decorative foolishness of the Hungarian building, the bombast of the Russian hall or the equally grand French, British and German pavilions, is meant to reflect the aesthetic aspirations of its respective sponsoring nation. I approach the faux Monticello from a side garden pathway, expecting to pass proudly under the stately portico and through its double front doors as I had at previous biennales. En route I stoop to pick up a crushed Coke can, something that needn’t mar the front lawn of my country’s pavilion. But I’m hit with disquietude when the pavilion’s front door is not only locked, but obstructed by truckloads of sand and gravel piled onto the porch. Squished paper cups, candy wrappers and drink containers further litter the approach. What the heck, I add my can onto the pile. 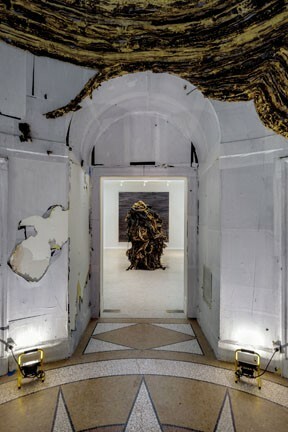 Then I think, whoa, perhaps Mark Bradford, 55, the Los Angeles-based artist commissioned by the U. S. Department of State to represent his nation this year, has thoughtfully placed each piece of debris. Am I desecrating his work? No, as I’d soon learn, he’d approve. I enter the five-room gallery building through a side, service door — perhaps one that Sally Hemings might have used 200 years ago if this were indeed Monticello. Immediately, I am all but blocked from moving freely through the space. A huge, tumorlike, rotting, three-dimensional construction, “Spoiled Foot,” its red and black surface fashioned with layer upon layer of tiny scraps of paper that had been blasted by a pressure hose — hangs threatening from the ceiling. Confrontational and restrictive doesn’t begin to describe the impact: The cultural, communal and political center has been lost, Bradford is saying. I slither along the outer walls to an open door and soon find myself in the rotunda. It’s a space that on previous visits I’d always found of geometric perfection and its clear glass oculus, elegant. Not at this Biennale for artist Bradford: The domed hall looks like Dresden after the blitz. Plaster melts off the walls, classical decoration rots, and the ceiling oozes some pusslike material in shades of nasty ocher and vomitlike dark brown. California artist Bradford transforms the classical rotunda of the U.S. Pavilion into an architectural ruin. It is obvious by now that Bradford is not amused by America’s current state of affairs. Surveying the gallery space, one English-speaking viewer says to her companion, “This is all so prescient considering what happening in Charlottesville.” The other nods as if to say, yes, things are upside down: Yesterday’s heroes and monuments and traditions and aesthetics are being challenged — and defended — to ruinous effect. Then … suddenly … redemption. In the next room the walls are freshly painted and hanging with three of Bradford’s exhilarating works. Exuding a feeling hope, they are galactic in scale and cellular in detail. Each rectangular work is a dense assemblage fashioned of tissue paper. As they shimmer slightly, their deep, built-up colors become as rich as the painted textures of master artists from an earlier generation — Jackson Pollock, Lee Krasner or Adolph Gottlieb. Bradford, whose paintings are highly coveted — they command seven figures in galleries — is the recipient of a MacArthur genius fellowship. But he comes from poverty, loss and racism. Black, he was reared in South Central Los Angeles and Santa Monica by a single mother who was a hair stylist. He made it through community college and found his artistic self at the California Institute of the Arts. His professional breakthrough came from works made by attaching repeated layers of the white endpapers, a cheap material, used in styling hair to bed sheets (less expensive than canvas). Maybe not. But it is Mark Bradford’s world and for now, “Tomorrow is Another Day” rules in the U.S. pavilion. “Tomorrow is Another Day” (organized by the Rose Art Museum at Brandeis University and the Baltimore Museum of Art with the U.S. State Department) and the 57th Venice Biennale continue through Nov. 26. labiennale.org.